The Decapitation is an old illusion and I'm not 100% sure of the creator. I know the origin of the illusion dates back hundreds of years. In fact, it might be the very first illusion. It was known as the John the Baptist effect for a long time. The historical John the Baptist was beheaded by King Herod. By 1584, the beheaded John the Baptist was turned into an illusion. It appears in The Discovery of Witchcraft by Reginal Scot as 'The Decollation of John the Baptist". In the illustration there is a long table which splits down the middle. Two holes in the table allow one actor to lay upon the table and put their head through, thus looking like the beheaded body, and a second act sitting underneath the table and inserting his head through upwards, so as to look like the head. It was usually set upon a platter or plate that also split in half to allow it to surround the persons head. It was a crude illusion and probably used for church dramas. which I'm referring. I know of at least two performers who presented it and given these two were big names in the art, there were likely others performing it as well. The two names are Alexander Herrmann and the other is J.N. Maskelyne. 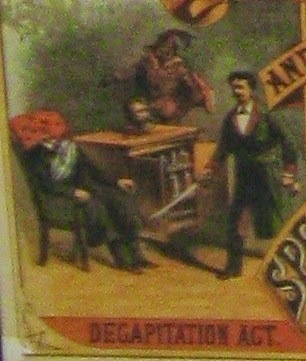 The version of the decapitation illusion they used involved a chair and a cabinet. Both items were made to look like ordinary furniture. The cabinet had glass doors in the front and was filled with bottles and plates. The chair just looked like an apolstered chair. In the effect, a person reclining in the chair would have their head removed and the severed head would be set upon the top of the cabinet. The beheaded body could still move its arms and legs with no problem. The head could smile and talk. 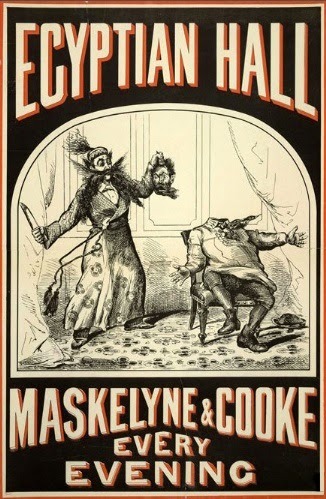 I imagine for the Victorian Era audiences this was quite a remarkable and yet grisly illusion. I saw one at the Salon deMagie, which is Ken Klosterman's wonderful collection of magic artifacts. I think the chair may have belonged to Alexander Herrmann to be honest. I also have a feeling this same chair and cabinet combo may have also been on display at the now burnt down Houdini Museum in Niagra Falls. The method is really quite remarkable and the workmanship that went into building these things is stellar. 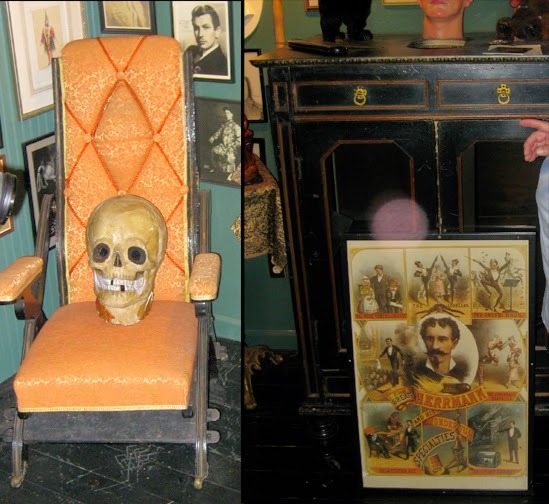 Below are two photos from my visit to the Salon de Magie and you can see the Chair and the Cabinet used in The Decapitation Illusion. If you're wondering if the skull is part of the trick, I'm afraid I really don't know for sure. Very cool! Thank you for sharing, Dean.